The second-fastest man in the world feels short distances suit his running style. Gay rests during a recent workout. 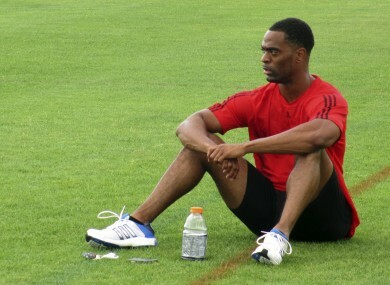 AMERICAN SPRINTER TYSON Gay has revealed he will put all his energy into the 100m event at the London Olympics, electing to skip the 200m. Gay, 29, said it was a tough decision to drop an event in which he won a World Championships gold in 2007, but he felt the shorter distance would suit his performance. “It only makes sense to focus on the 100 after the setbacks I have had this year,” Gay told Reuters. Gay is the second-fastest man in the world over 100m behind Usain Bolt, and he said he feels he is all but a certain starter in London this year, ahead of the national trials. “It is not going to be easy. Someone always comes out of the blue to try and grab a spot, but I really do expect to make the team,” Gay said. Injury problems have plagued the Florida resident, most recently groin and tendon issues, and Gay said they were serious ailments he was forced to overcome, before only recently getting back into training. “On a scale of one to 10, I would say it was a 10,” Gay said. “Other problems I would have, they would nag for a little bit but they would go away. This is something that has been lingering. The USA trials for the men’s 100m get underway on June 23 in Eugene, Oregon, with the final the following day. Email “Ready to go: Gay chooses to focus on 100m event ahead of Olympics”. Feedback on “Ready to go: Gay chooses to focus on 100m event ahead of Olympics”.